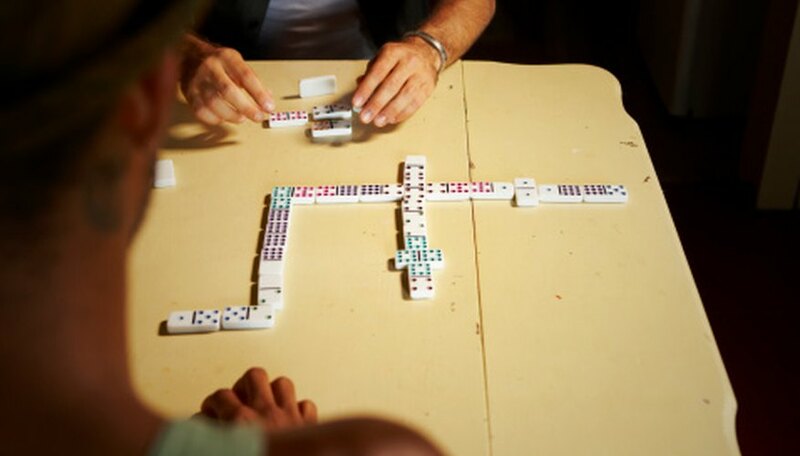 In the Dominican Republic, dominoes is a national pastime. The primary goal of the game is to play all of the dotted tiles in your hand by matching them with other dotted tiles that have been played. Typically, in Dominican dominoes, up to four players draw seven tiles divided into two squares containing zero to six dots respectively. Players take turns playing their tiles and if they cannot match their tiles to the ones on the table, they must pull more tiles from those leftover pile or forfeit a turn. Lay all the dominoes face down on the table. Each player draws seven dominoes, either all at once or alternating selections. Identify the player with six dots in both squares of his domino (double sixes). That player goes first by leading with a tile of his choosing. The next player must play a tile featuring a square that matches one of the squares in the first tile played, draw more tiles until he finds a match or skip his turn. If four players are playing there will be no extra tiles to choose from. Rotate turns counter-clockwise with each player matching his tiles with those on one of the ends of the dominoes chain. All doubles, a tile featuring the same number of dots in each of its two squares, must be laid crosswise in relation to their matching square and cannot be played off of. You receive points for the total number of dots on the tiles that you play. The first player to get rid of all his dominoes gets the total number of dots left in each of his opponent's hands added to his point total or his team's point total. Score the game to 200, 250 or 500 depending on preference. If a player is unable to play a tile, the opponent who last played gets an extra 10 points if the game is being played to 200 or 250 and 25 points if the game is being played to 500. If all three players are unable to play, that opponent earns 25 points. If the last piece played matches the tile of dots at the opposite end of its domino chain, but isn't a blank or double, that player gets 25 points. Finally, if a player performs a "tranque" by playing a tile that prevents anyone else on the board including himself from playing a match, he gets all of the points in his opponent's hands if his tiles add up to less than the tiles of the player to the right of him. Anthony Rose has been writing since 2009, covering home improvement, health, business and politics. He holds a Bachelor of Arts in history from Tulane University.